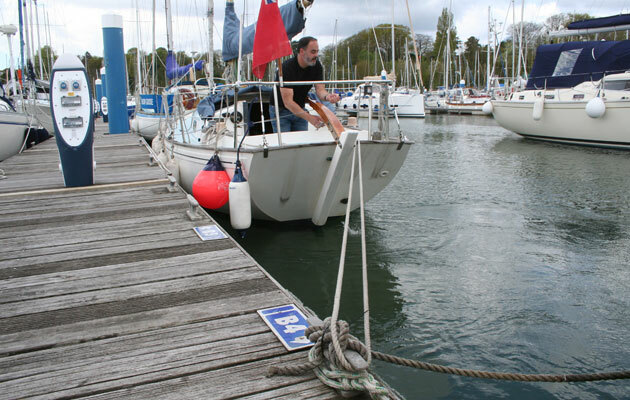 Leaving an alongside berth with the wind blowing the yacht on usually requires the use of a bow or stern spring. The same applies if room to manoeuvre is limited by a fairly tight berth. The stern spring tends to be the preferred method in most situations. It allows you to leave going ahead so that steerage is almost immediate as you engage forward and the propwash hits the rudder. However, to do this, the bow must be forced up to windward sufficiently to clear the boat, or boats, moored ahead, which may not be possible using a stern spring. Motoring astern against a stern spring will certainly push the bow off the dock to windward, but at some point you need to put the engine in neutral before engaging forward. It may only be a couple of seconds but that can be long enough for the bow to blow back far enough so that you can’t now clear the boat ahead. An alternative method is to use a stern ‘sprong’. With the sprong on the offside and the prop’s thrust driving towards the pontoon from the centreline, a turning moment is created that powers the boat off the pontoon. 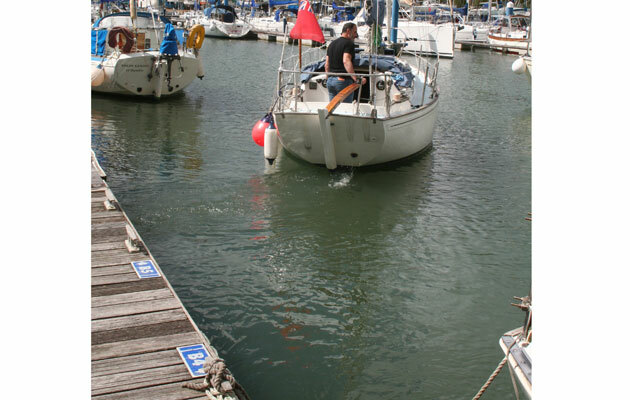 There are occasions when spronging may be the only way to get the yacht out of the berth so, as with any manoeuvre, it is worth practising it where there is plenty of room to find out how it works for your yacht before you need it. Here, YM editor Kieran Flatt gives it a spin in his Twister 28, Cleaver. 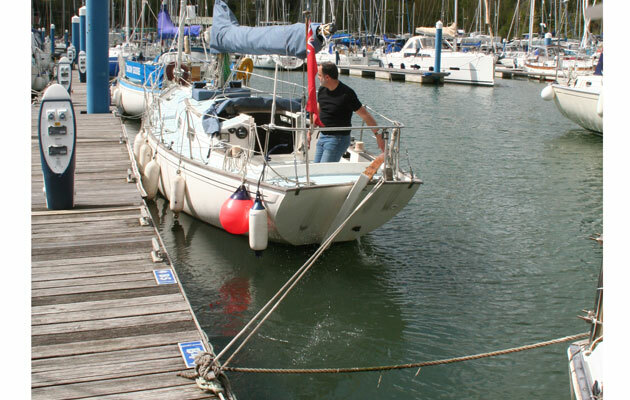 Rig a long slip line on the offside quarter to a cleat or bollard as far aft as possible without fouling the boat astern. Ideally use a free cleat and a multibraid slip line to reduce the chances of fouling. Fender the nearside quarter generously. With the sprong rigged, remove both springs, then the stern line and, finally, the bow line. 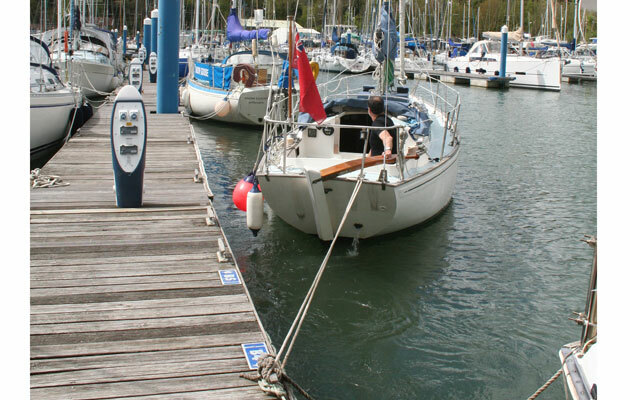 The wind will be pushing the boat onto the pontoon but if the current is pushing you into the boat astern, idle in forward gear with the helm centred. Turn the wheel hard towards the pontoon, or push the tiller away from the pontoon, and engage forward gear to take up the slack on the sprong. The stern will move out at first, then be shoved back in by the turning moment. With the helm hard over, increase engine revs in forward gear. 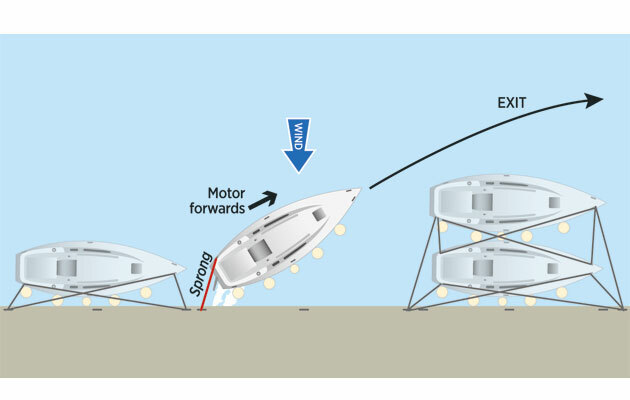 The turning moment created by the prop’s thrust on the centreline and the sprong on the offside quarter will drive the bow off the pontoon – perpendicular to it if needs be. 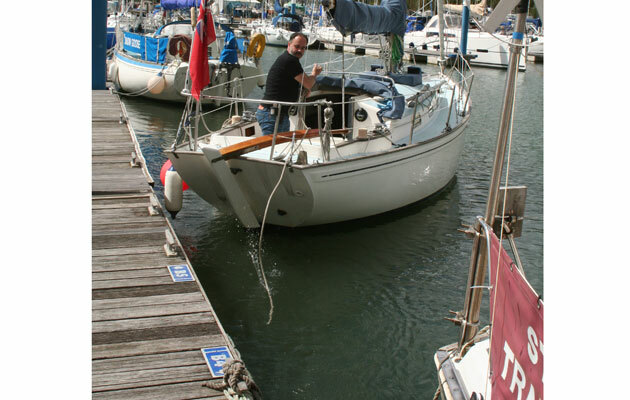 When the bow is far enough out to clear the boats moored ahead with a decent safety margin, reduce engine revs and slip the sprong and haul it in quickly. If it fouls, be prepared to cast off the line and pick it up later. Once the slipped sprong is aboard so there’s no chance of it fouling the prop, centre the helm and increase engine revs and away you go! It’s a neat, shorthanded way of getting off the dock when you’re being blown on. In stronger winds, or if space to manoeuvre is very limited, a combination of spring and sprong can be used. 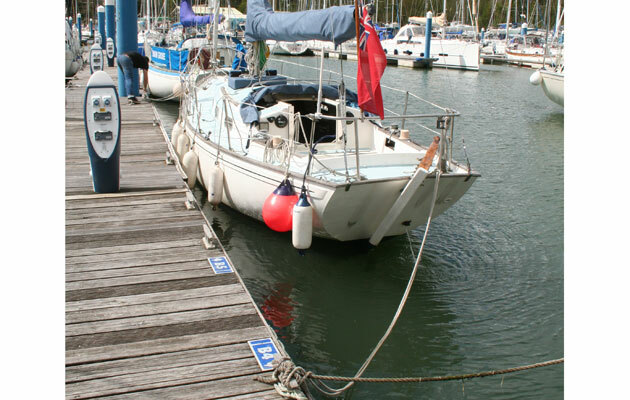 This combination is particularly useful if the position of the dock cleat means it’s not possible to rig a long sprong, or when you need to drive the bow out against the tide, provided it’s not more than 1 knot or so. Rig a stern spring and a stern sprong. Turn the wheel hard towards, or the tiller away, from the dock. 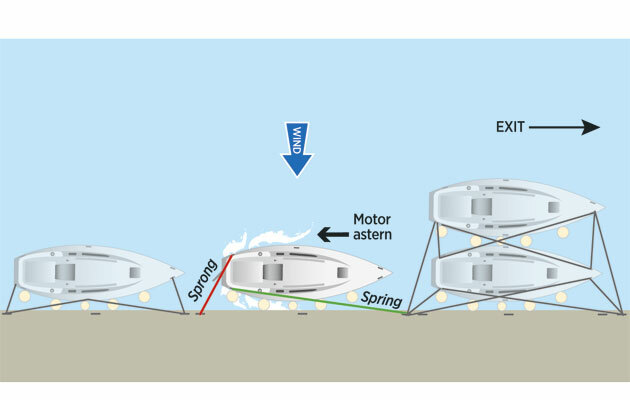 Motor astern against the stern spring and pull in the slack on the sprong as the yacht rotates. When the bow will not go out any further, engage forward gear and increase revs, as you would for spronging. Slip the spring and bring it onboard, and motor ahead against the sprong as before.